The 60s saw the advent of many brands in consumer products of daily use. (Read the first part of the series here). 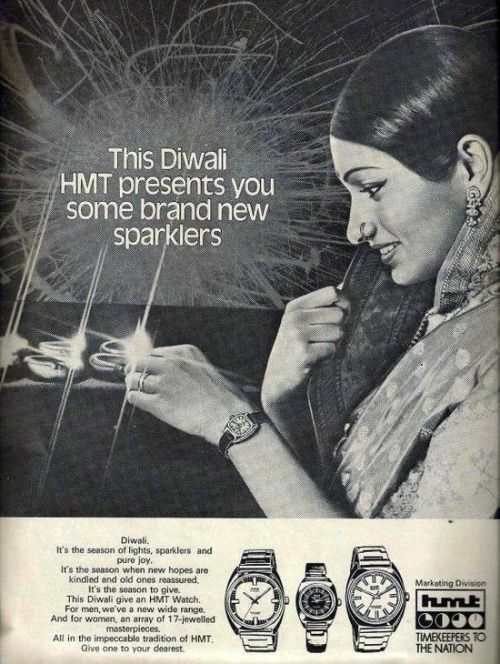 However, it was in the 70s that the markets really ‘opened’ up for several iconic Indian brands to flourish. Branding literally lifted roti and kapda and a host of other products of daily use out of the category of ‘necessity’ and set them into the lifestyle bracket. For the first time, fashion entered the lives of the middle class, as good brands became affordable in many product segments. Everyday items got a brand makeover – hair oils were replaced by hair creams and scented oils; coal ash from chulhas used for scouring vessels were replaced by Vim and Odopic cleaning powders; shikakai and ritha powders were replaced by bottled shampoos, and so on. No more ash for my vessels! The ads focused on the aspirations of the people, who were trying to improve their living standards. Branded goods were comparatively more expensive than generic ones, and budget-conscious parents – like my own father – were reluctant to make the shift for many years. I was lucky to have two elder brothers who were both earning well by the time I hit the teens, and many of the things they gifted me became my prized possessions. Born into a world where these products and more were already part of everyday life, it would be difficult for the younger generations to comprehend the momentous changes that these brands had brought into our lives. It is as much for their benefit, as to satiate my yearning for nostalgia, that I had started this series. Coming back to the post, let me start with the morning brands. In the early years, most people used only tooth powders. These ranged from charcoal powder to salt and even fine ash, in addition to local tooth powders. 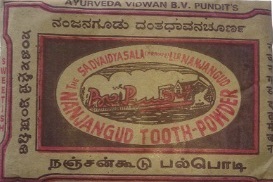 I remember using the sweet, pink-coloured Nanjangud tooth powder, which came in small brown paper sachets. There was also Gopal tooth powder and later Colgate tooth powder which was smooth, white and saccharine sweet, which I didn’t like at all. 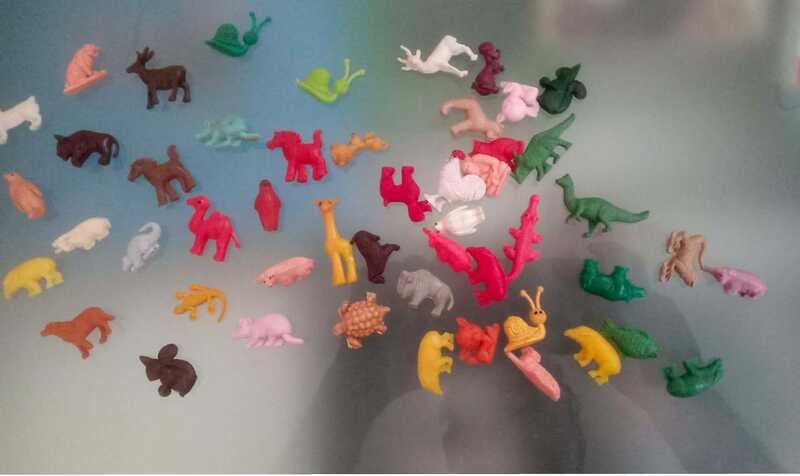 We bought Binaca toothpaste and I loved it because of the cute little collectibles of soft plastic charms that came with each pack, not to forget the Binaca Geet Mala. (This will have to wait till the next post!). The other well-known brands were Colgate and Forhans. 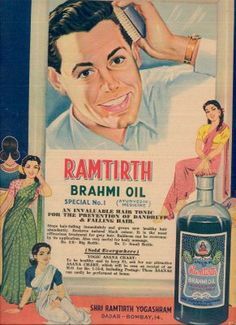 Dabur, a new entrant in the early 70s with its Promise toothpaste and Vicco Vajradanti, both boosted by blitzkrieg ad campaigns then, have slim market shares even at present. 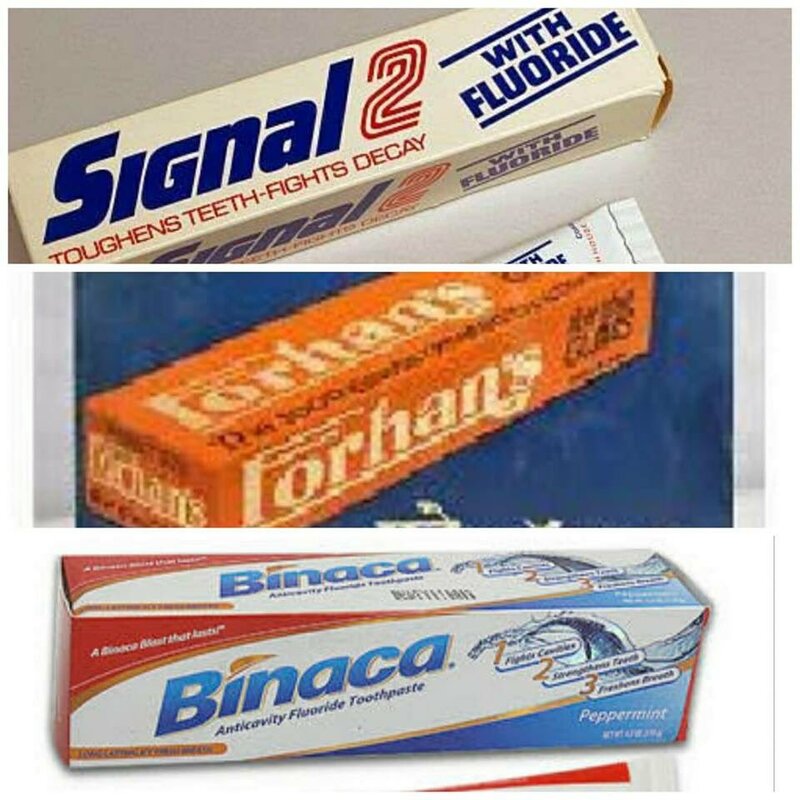 Colgate has today become a generic name, while Forhans has disappeared and Binaca with its change of name to Cibaca has lost its sheen. Toilet soaps like Lifebuoy, Hamam and Godrej No.1 were the trusted and ‘healthy’ soaps of the middle class. 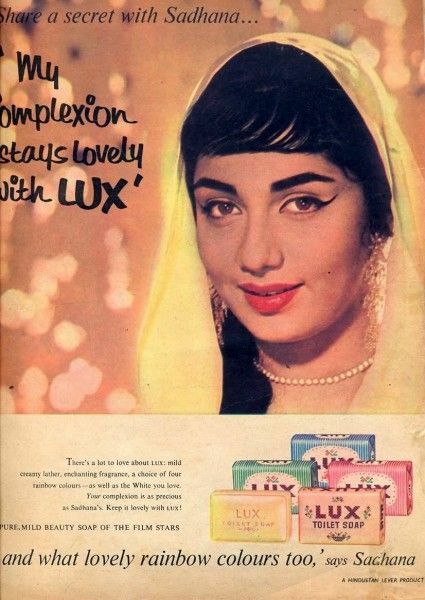 Soon the focus shifted from size and health to beauty with soaps like Lux and Rexona. Companies added glamour to the package by marketing them as the beauty soaps of film stars. Mysore Sandal soap and Margo, were the other popular brands. In the super luxury category was the round and creamy Moti soap, beyond the reach of the middle class. Then came Lux International, a distant cousin of Moti, and I remember buying it with my meagre pocket money, since my father refused to waste money on a luxury soap! We had Pears, the original glycerin soap, which was the preferred soap for babies – besides besan and green moong powder, that is! I must not forget Liril, the ‘lemon soap’, which reached the top slot riding on the back of the immensely successful TV ad campaign in the 70s, featuring the bathing beauty – Karen Lunel. Interestingly, all of these brands are still available today. However, we can’t say the same for washing soaps, which seem to have disappeared from metro markets. 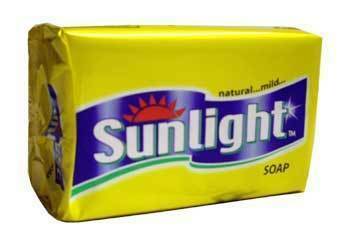 At that time, 501 bar soap was the leading brand, followed by Sunlight. We soaked the clothes in buckets with either soap chips or soap powder. Branded washing powders like Det, Surf and Sway were available even in the early 60s. There were light and dissolved instantly. Detergent bars and powders entered the market by the early 70s. 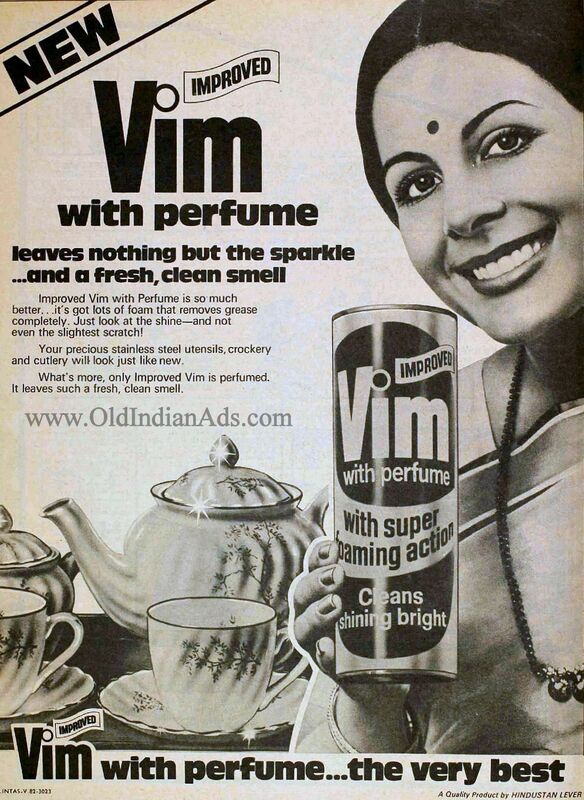 But a small town brand Nirma sent shock waves through the big players’ hearts with its phenomenal success in the 70s and is still going strong? Today washing soaps are also making a comeback, albeit in eco-friendly avatars. Cosmetics were limited to talcum powder in my childhood, and brands like Ponds, Cuticura and Remy were the leading brands. 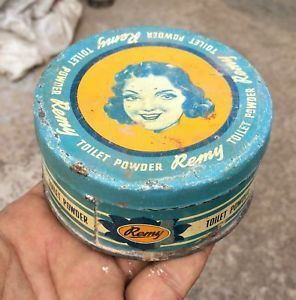 Remy with its round carboard box had loose powder that had to be dusted with a powder puff on the face and neck. Sadly, it was the first to disappear and then Cuticura. Ponds soldiered on, adding to its product range with cold creams, vanishing creams (the archaic name for moisturisers) and powder compacts. Lakme was the main contender to Ponds then. Watches have since undergone a roller-coaster ride. From becoming so popular with almost everyone wearing one till the 80s and even mid-90s, they nearly went out of fashion – when mobile phones doing the work of a watch – before making a strong comeback as a fashion statement in the 21st century. Titan rules this niche market, with jewel watches and designer watches, bolstered by classy TV ads. Footwear of our time was functional, with people usually owning just a pair of them, with maybe a pair of shoes for school/college/office, in the 60s. Schools were lenient as regards uniforms and footwear. Only the convents insisted on black shoes. Oh, how I used to envy those smartly dressed girls in their pinafores and shining black shoes with the smart buckles! But we lesser mortals had to wear white canvas shoes for PT classes and mass drill on Saturdays. 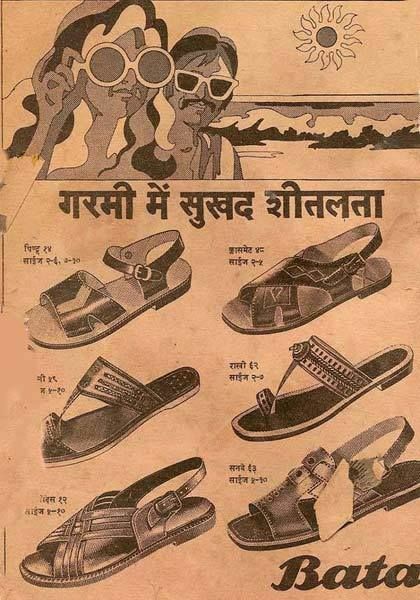 There was just the one brand – Bata, and we all wore that. No, wait, there was also Corona, but it was a distant second to the brand leader. 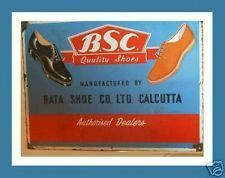 Bata was then known as BSC (Bata Shoe Company and Corona as CSC! There were no fancy showrooms, but small shops that had either Bata or Corona footwear – simple functional ones that were sturdy and durable. Half a century and more later, I still prefer Bata footwear over all others. If you want to see the contrast between generations in matter of footwear preferences, you should read this delightful post by my young friend Deepthy. By mid-60s branded clothing had come into the market. There were many famous cloth mills at that time and their names themselves were their brands: Binny, Century, Thackersay, MaduraCoats, Mafatlal, Modi Cotton, Bombay Dyeing and many more. New synthetic fabrics like terylene, polyester, chiffon and nylex had taken the industry by storm. Handlooms and natural fibres were pushed to the background by these new-fangled fabrics..
All top textile mills had men’s suiting, which were mainly bought by the middle class for weddings! By the mid-60s, shirts were available readymade. I think Liberty was the first branded shirt that was favoured by my brothers, who had only worn tailor-stitched clothes till then. In the 70s, Zodiac made a big splash in the men’s accessories market with their classy ties. The ad featuring the bearded male model wearing their tie is still fresh in memory. But it was saris that were there literally all over the place! I had begun wearing saris in my late teens, like most girls of my generation, and had a vast choice of fabrics in addition to cotton and silk. Textile brands used film stars to give their garments the glamorous appeal. 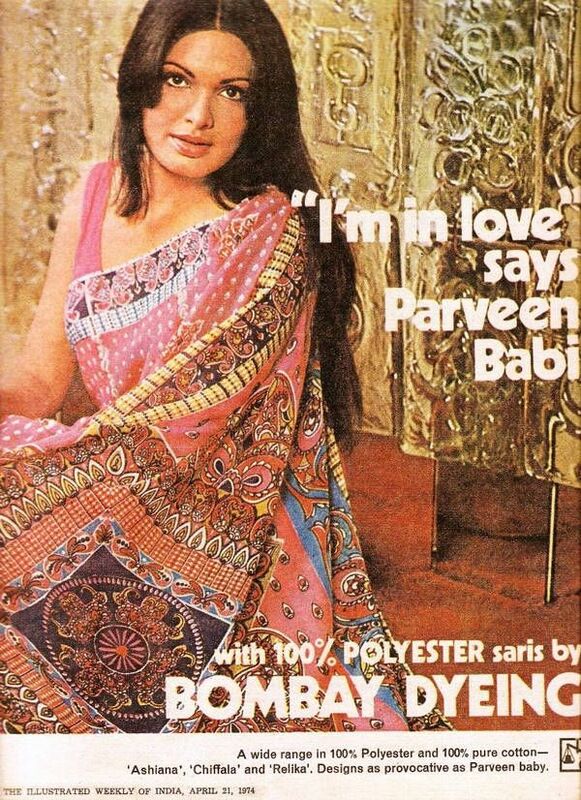 Bombay Dyeing saris were all the rage for this reason. 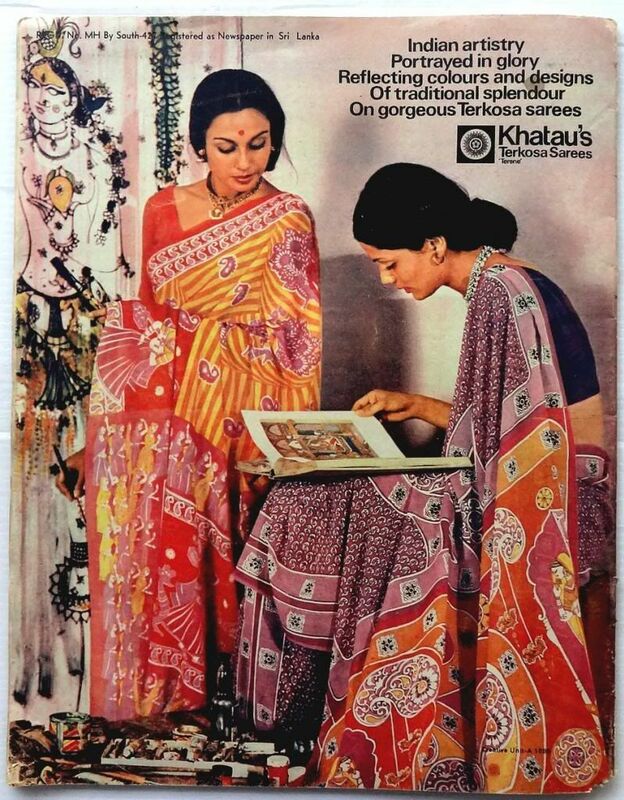 Khatau Voile saris were elegant, light and comfortable with their distinctive prints, which made them the working woman’s first choice (Oh, how I miss them!). Binny’s pure silk saris with their understated, elegant zari spelt sophistication and class. But the very first expensive sari I got from my second brother was not from any of these brand but from S.Kumar’s. Their saris were among the most expensive and classy. I still remember the colour and design and the feel of the light-as-air mixed yarn on my skin; it was light pink, with gorgeous floral motifs and so easy to care for. It had cost a whopping Rs120, at a time when saris were available for as less as Rs 20, with even a baseline Kancheepuram silk sari not costing more than Rs 200! Talk of being spoilt by an elder brother! 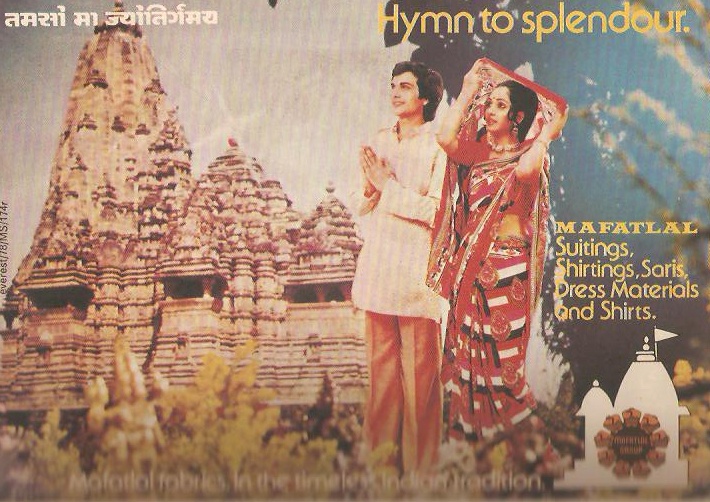 The other brand of saris that made a big splash was Reliance’s Vimal. With the ‘Only Vimal’ jingle and glamorous models to showcase their absolutely gorgeous collection of screen-printed designs in stunning colours and designs, Today, the popularity of the sari as the daily wear has gone, with other dresses having displaced it as the garment of choice for the Indian woman. It is only dinosaurs like me who still favour the sari as a daily wear. Once the chest of nostalgia is unlocked, memories just keep tumbling out. 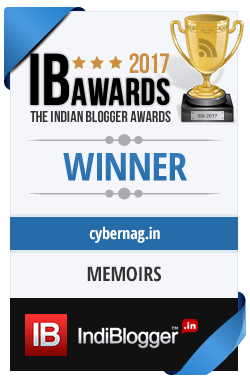 I have given you a tiny glimpse of packaged foods and some daily necessities, which had become lifestyle items in the first two posts. In the next one, I will bring you some consumer durables – of a half century vintage. Thanks Rahul. At the rate that brands are ‘dying’ these days, some of the brands of our times can be called immortal, since they have defied the life cycle of products, right?